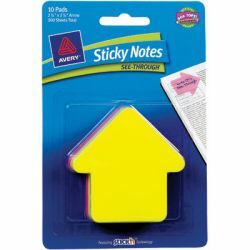 Catalog Home > Avery® See-Through large Arrow Sticky Notes, Yellow/Magenta, 10 pad per pkg/30 shts per pk"
Avery® See-Through large Arrow Sticky Notes, Yellow/Magenta, 10 pad per pkg/30 shts per pk"
Transparent not with a writable surface; write a note and still see the content underneath. Removable adhesive - easy to stick on and remove without damaging originals. Works best with ballpoint pens, permanent markers and pencils. There are 10 pads per package, 30 sheets of large yellow/magenta arrow shapes per pad."